You can block any person from using their account simply by setting the login status of the person to ‘Suspended’. 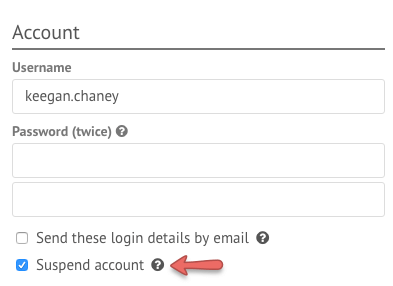 Suspended accounts still count towards your active adult count however. Simply click the ‘People’ link in the Admin Area menu bar and search for the person’s name. Once you click on the person’s name, their profile will be loaded. Click their ‘Account’ tab and this will then load the person’s details where you will be able to edit their account details. Under their Username and Password you’ll see a checkbox to suspend their login details. You can also use Mass Manage to suspend multiple accounts at once. Simply select the people you want to suspend, and go to Change People’s Field > Status > Suspended.